Welp, it’s all over but the Tweeting (and the next two SAP TechEds). 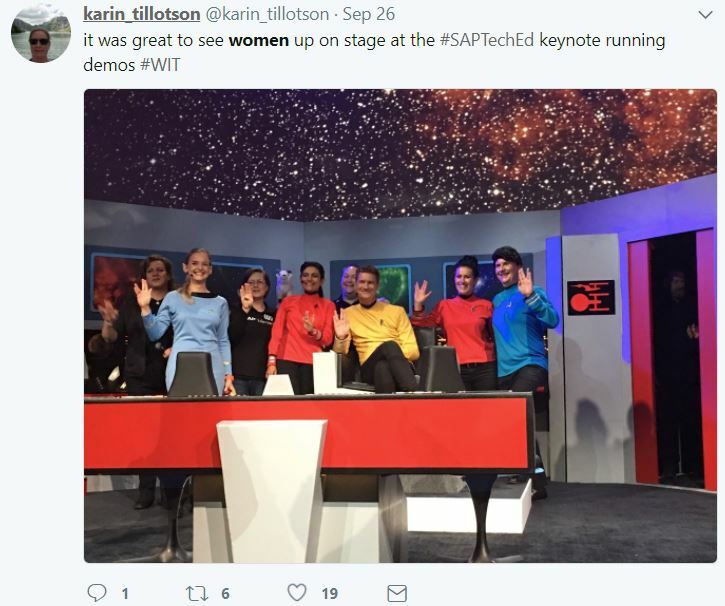 Months of planning, hundreds and hundreds of session hours, and one whirlwind week at SAP TechEd Las Vegas is coming to a close, and you had a LOT to say about it on Twitter! 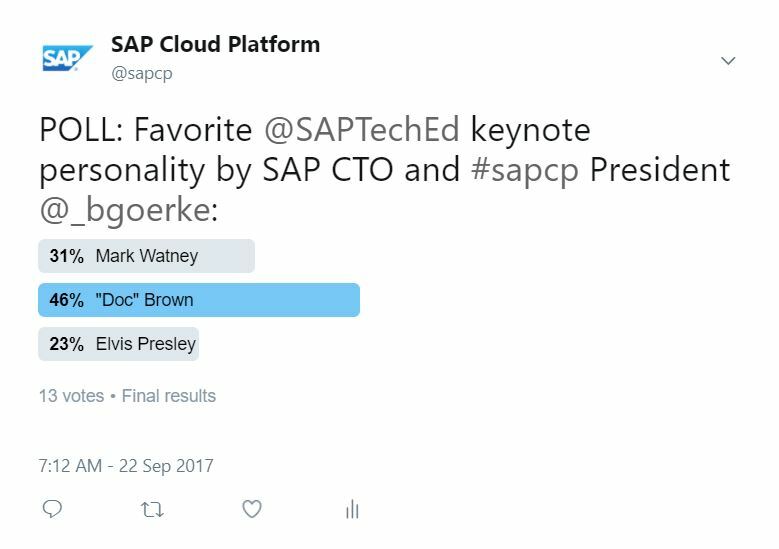 I’m one of a small group of people with the privilege of moderating SAP Cloud Platform’s Twitter handle at @sapcp, and while I was preparing our internal report for this week, I thought I might as well share it with everyone, since you are after all the ones who made it happen. I’m using our social media tools as well as Twitter’s analytics to report on what the week was like, though these tools are far from perfect, and I add my own subjective opinions to the mix. While these takeaways are hardly scientific or conclusive, they aggregate what I think were the major points. Let me know your own thoughts and anything I might have missed. 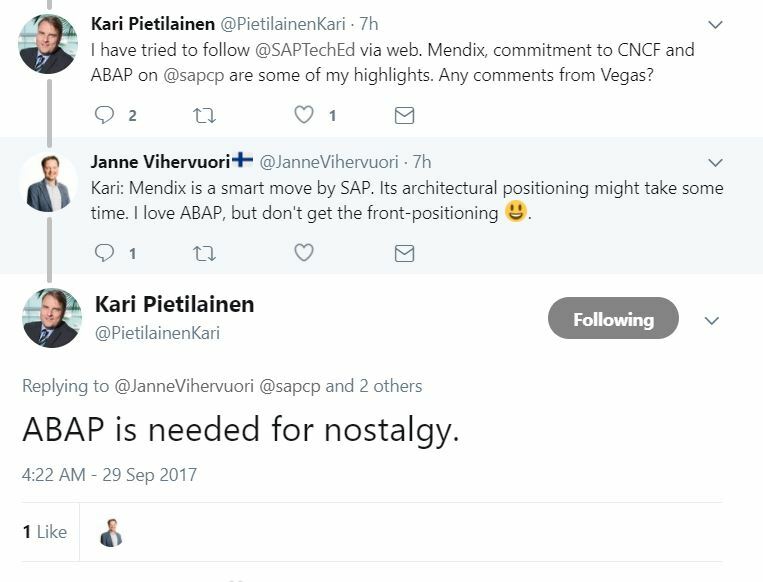 Also feel free to let us know if what @sapcp Tweeted was helpful, too little, too much, or something in between. Your feedback always matters most! 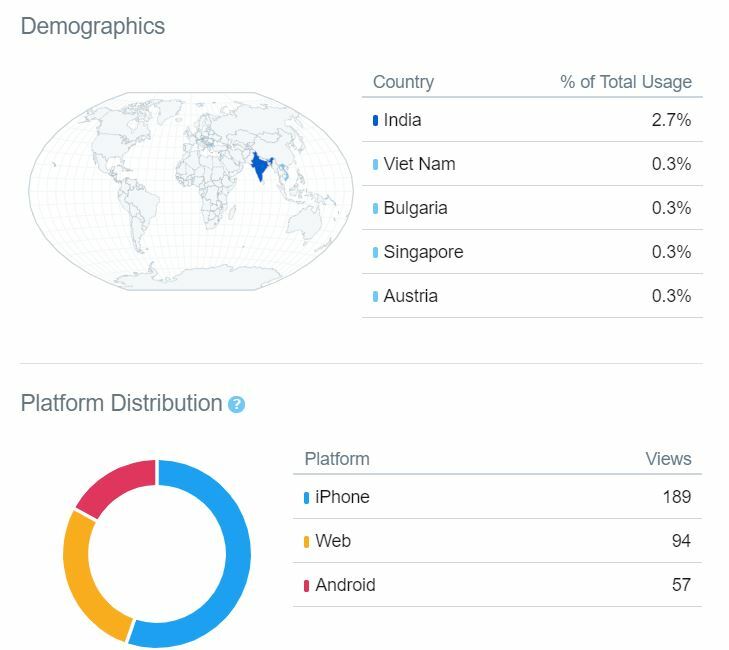 Thank you for engaging! 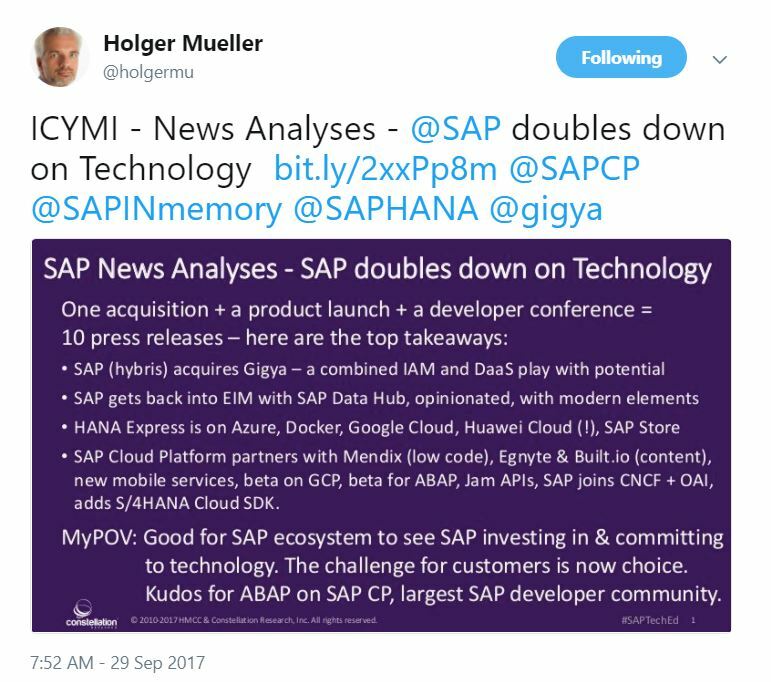 The major SAP TechEd announcements: cloud, cloud, cloud, cloud, and cloud! 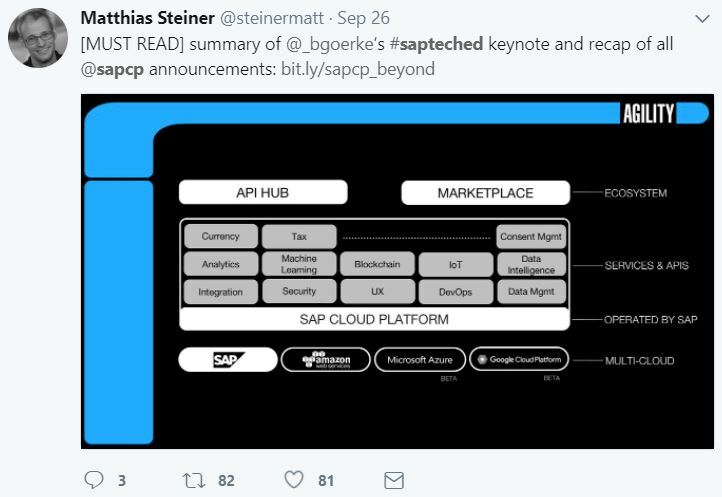 It’s hard to beat Matthias Steiner’s influence in the SAP Cloud Platform universe, and his sharing of Bjoern Goerke’s announcement blog showed huge reach. From the moment he took the stage, it was clear on Twitter that JT Kirk’s — Bjoern’s – keynote was going to knock it out of the park, and that it did [WATCH]. Folks also appreciated seeing women doing technical demos on the TechEd stage. 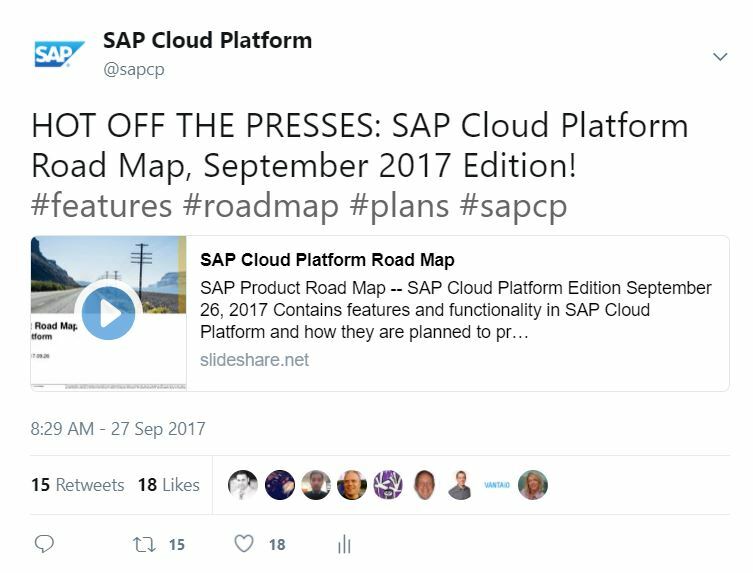 The must-read SAP Cloud Platform companion blog by Bjoern was the most-shared blog on Twitter, and has 1261 views as of today, three days after publication. 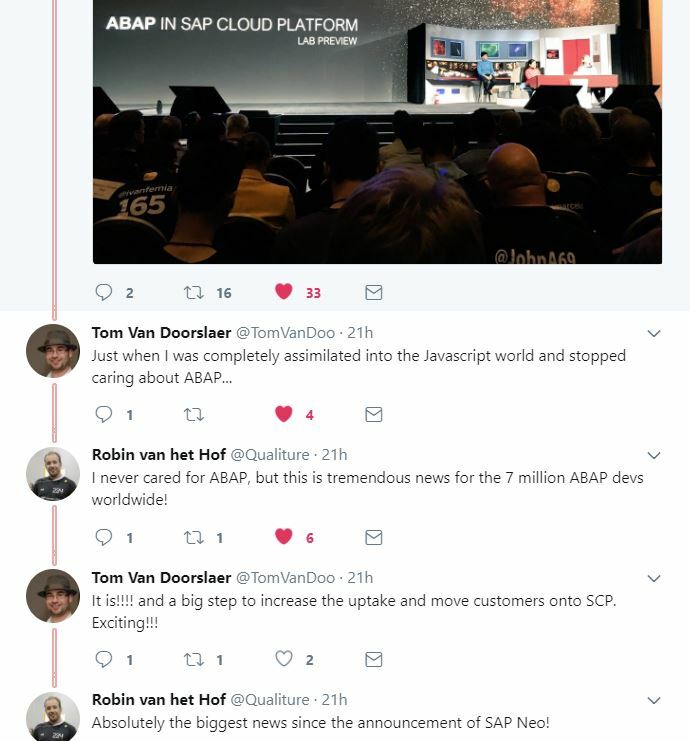 The ABAP announcement blogs by Florian Wahl – https://blogs.sap.com/2017/09/26/sap-cloud-platform-boldly-going-beyond/ and https://blogs.sap.com/2017/09/26/overview-of-abap-in-sap-cloud-platform/ – clock 1100 and 500 views respectively, but the rest of the cascade has significantly fewer views, indicating that Twitter is driving the majority of traffic, since Twitter really hyped Bjoern’s blog and the ABAP blogs. 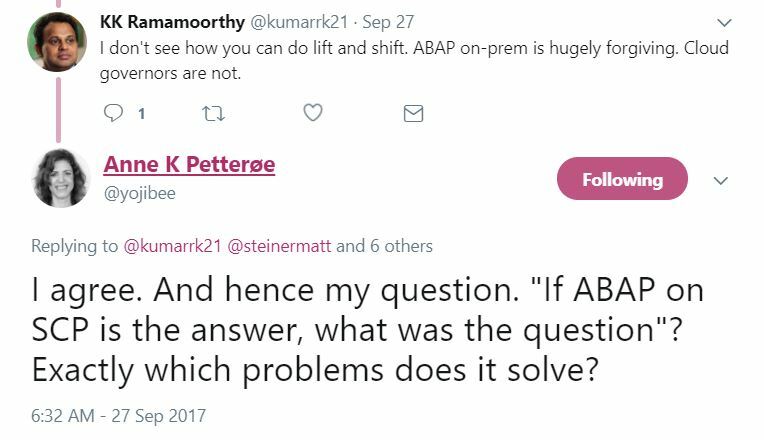 Those related blogs are nevertheless important and include Harsh Jegadeesan on API Business Hub (101 views), Michelle Huang on Mendix (180 views) and Arun Bhaskaran Nair on the SDK for Service Development (279 views, published a couple weeks earlier). 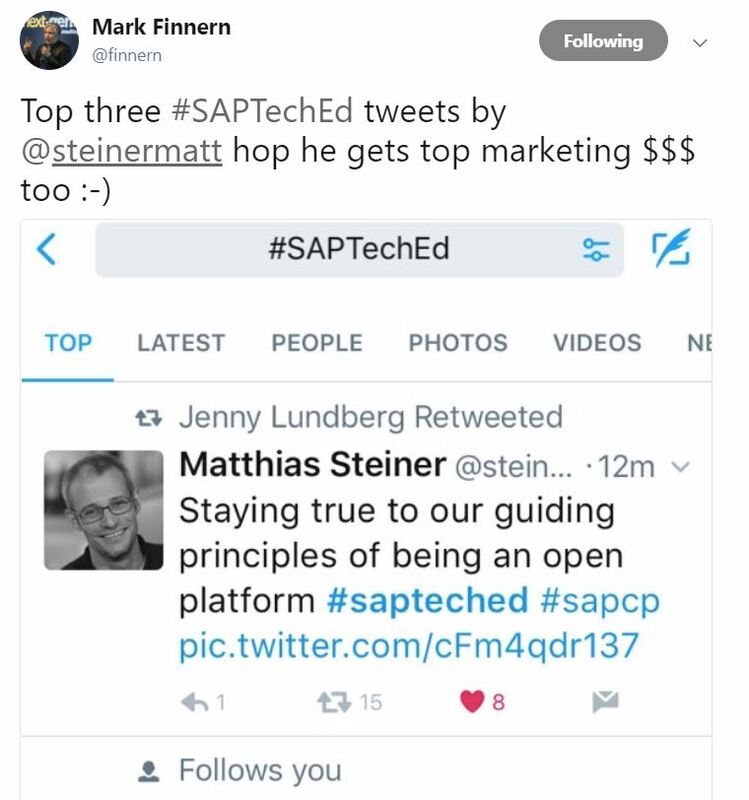 Did you blog a wrap on SAP TechEd? Drop it in the comments. 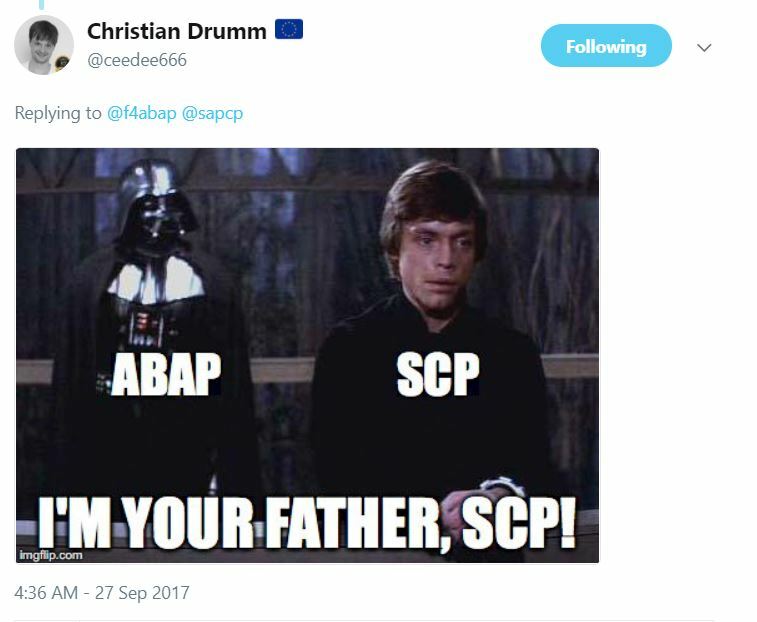 Yes, you are passionate… about ABAP! 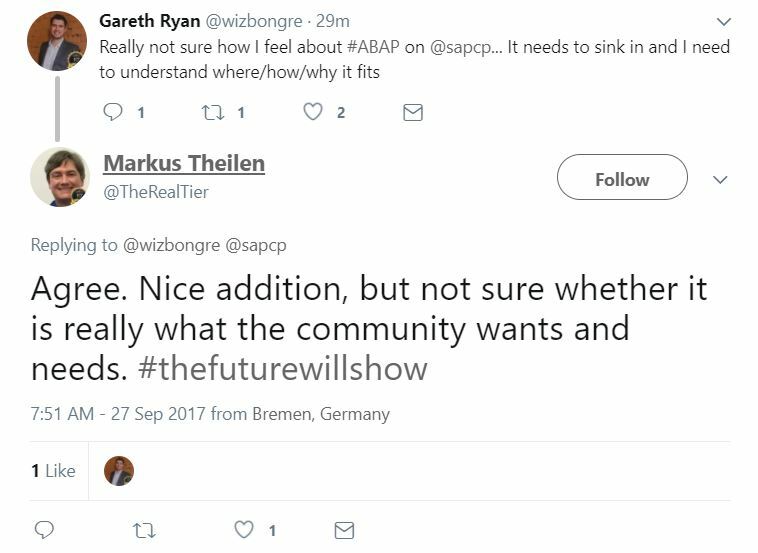 There is no shortage of opinions about ABAP, and this announcement accordingly led to a lot of chatter on Twitter. 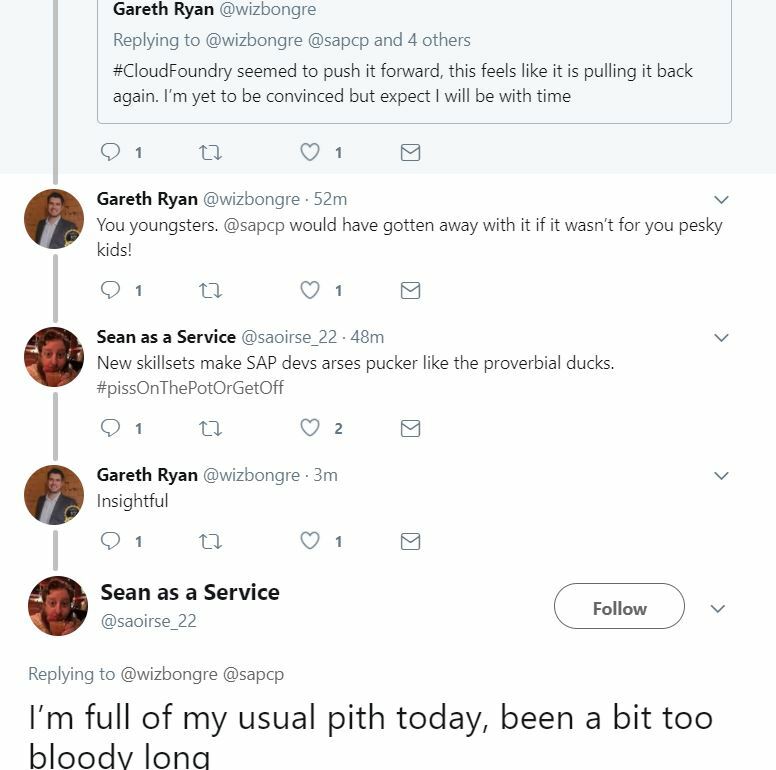 The comments threads on the two announcements blogs by Florian Wahl are vibrant but don’t hold a candle to the raging conversations on Twitter. Yes – we tweeted a lot this week… 523 times, to be exact. … including a whopping nearly 200 tweets on Tuesday keynote-day alone. That’s about 8 Tweets an hour averaged over the day – not too much, right? Especially since you engaged with every tweet, on average, over three times each (you liked, retweeted, or replied to it). Those are the metrics I want to see: What are you doing with our info? What are you saying? While I’m glad that’s high per tweet, how you interacted with YOUR tweets blows it away. Not only did you in aggregate have a lot more to say about us than we did, but people are also talking more about what you had to say about us than what we did. So who did all that talking? Who’s tweets reached furthest (appeared in the most timelines)? 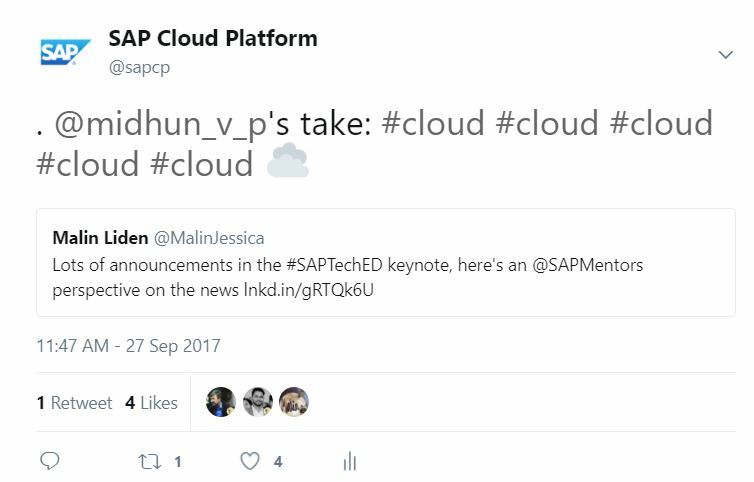 The bottom line is that SAP Cloud Platform is more than a brand – it is an ecosystem, and one in which individuals pack the most influence and trust over our brand. Ergo: Use YOUR voice – it matters! I have just a couple more takeaways. This week’s initial statistics show that video is viewed at least three times more often on Twitter than on YouTube. In contrast, videos posted to YouTube show only up to a third of the view counts, and that’s even if we Tweet links to them. Though that’s a hard comparison since YouTube isn’t currently the ‘push’ channel that Twitter is, that tells us we probably want to invest more on Twitter-hosted video and even experiment more with live video. The stats show though that people drop off significantly the longer a video is, so the key is to keep them short enough – below even Twitter’s default max length of 2:20minutes. Do you agree? Yeah we tried a poll once or twice this TechEd season. This one ran for a day and only 13 of you responded – so I’m not sure where we go with this. Maybe we need more relevant questions? Elvis, by the way, has left the building. Thanks for being there Champ! Can’t wait to see your takeaways!